During the first appointment for getting a dental bridge, the teeth on either side of the missing space will be prepared. 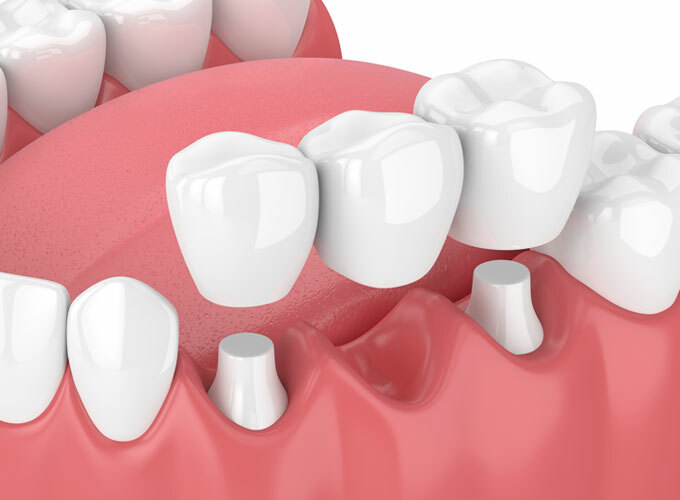 Preparation varies depending on the type bridge but generally involves leaving a portion of enamel around the teeth either side of the space to allow room for the crowns to be placed over them. Impressions of the teeth are taken, which serve as a model from which the bridge, pontic, and crowns will be made by our dental laboratory. Dr Malakonakis will make a provisional plastic bridge or crowns to protect the exposed teeth and gums while the final bridge is being made. It generally takes 2 weeks for the laboratory to fabricate the porcelain bridge. Once the bridge has been made, at the second appointment, we will confirm the fit and aesthetics prior to permanent cementation. Gymea Dental uses only local,high-end and well established laboratories in the heart of Sydney where both the technician and Dr Malakonakis work together in close collaboration to ensure they achieve your goals and an excellent finished product. WE DO NOT SOURCE ANY LABORATORY WORK OR PRODUCTS OVERSEAS TO CHEAP AND UNRESTRICTED LABORATORIES. Typically, bridges can last for about 10-15 years, though many patients will have their bridge for a lifetime. Bridges need to be replaced when they have chipped or broken, though most bridges may fail due to other issues such as decay of the tooth under the crown or by gum disease. Regular oral hygiene visits and a good diet and home care is important in maintaining bridges.